Ormesby Table Tennis Club was founded in 1957 and has continued to provide facilities for coaching and competitions at all levels for the past 53 years, firstly in the garden of Alan Ransome’s house on Meadow Close, Church Lane, Ormesby, then at the Middlesbrough Tertiary College and finally in our own new facility on Cargo Fleet Lane in Middlesbrough. The club started in a former chicken hut that was just big enough for one table. It was expanded when a second hut, a former quarry hut, was purchased which facilitated a further two tables plus changing rooms and toilets. With assistance from a local builder, Joe Whittingham, the original chicken hut was demolished and a new brick building big enough for four tables with a sprung wooden floor and good lighting was built in its place, and this provided the opportunity for both an expansion of the teams in the local Middlesbrough league and regular multi table coaching and training facilities. The highlight of the Club’s history was in 1972 when Ormesby won the European Club Cup (see photo below), the only English Club still to have achieved this honour. Winning the Europe Club Cup was not only remarkable because Ormesby was a team made up of players who all lived within a few miles of the club, but also to beat in the final the Swedish club, Falkenberg, whose team included three Swedish internationals led by the then current World Champion, Stellan Bengtsson, and in the semi final to beat the legendary Hungarian club, Budapest Spartacus whose team included the 1975 World Champion, Istvan Jonyer, was incredible. 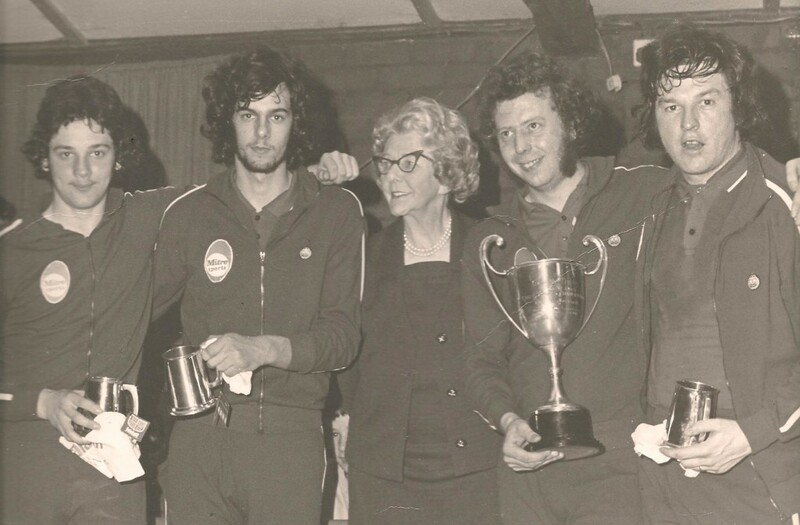 Ormesby not only dominated the men’s English table tennis scene but also won the English women’s club championship on three occasions with a local team comprised of Linda Bashford, Carole Knight (Moore), Angela Tierney, Jane Skipp (Durham), Helen Robinson (Stoker), June Williams and Norma Carne (Bonson). During the 1980’s and early 1990’s Ormesby participated in the British League, winning it in 1991. Many famous players represented Ormesby in the British League, including Chen Xinhua, Alan Cooke, Donald Parker, Richard Yule, Nigel Eckersley and Calin Kreanga. After the retirement from the club of Carole Moore, Alan Ransome took responsibility for the coaching programme and once more developed a strong squad of girls who went on to win both the Junior British League and Women’s British League in the 2009/10 season. This squad included Karina Lefevre, Karen Shepherd, Chloe Whyte and Jessica Dawson. With support from Sport England and the English Table Tennis Association, in 2008 Steve Brunskill was engaged as the club’s Coach Manager to develop coaching at all levels from schools, where the club is part of the Premier League for Sport programme with Middlesbrough Football Club, and with squads running at beginner, advanced and excellence level. A further development in 2010 with support from Middlesbrough Council has been the employment of Malcolm Muldoon as the club’s Activator with the objective of expanding participation for adults, particularly for 50+, players with a disability and women. As well as running a program for talented players, Ormesby Table Tennis Club offers a wide range of activities for players of all ages and abilities and the opportunity for members to represent the Club in both the Middlesbrough & District League and the Cleveland Summer League. There are club nights for senior players, after school sessions for beginners, and a Saturday morning Junior Club giving youngsters an introduction to the sport, and the opportunity to benefit from basic coaching and to play competitively in the Ormesby Junior League. The Wednesday and Friday sessions for people with a disability introduced in 2009 and the Monday and Thursday 50+ sessions started in 2009, have provided a new dimension for the club’s activities in the local community and are all well attended. Bruce Lowther has been most helpful with the disability groups from the start. Ormesby Table Tennis Club has a dedicated Management Committee which meets regularly, comprising Alan and Jose Ransome, Brenda Stephenson, Gary Whyman, Karl Shaw and Martin Rutter. Ormesby Table Tennis Club would like to acknowledge the support it has received in the past from many individuals to ensure the ongoing development and ultimate success of the Ormesby Club into one of the best table tennis clubs in the country. To Bob Ransome, for providing the original premises, financial support and leadership. Bob was also the President of the club from the start until he died in 1994. To the following coaches who contributed to the success of the Ormesby Club in it’s Golden Years: Bob Wiley, Bob Hindle, Dave Holden, Harry Robinson, Eugene Jennis, Bob Rowlands, and Pam Richmond. To the late John Brown and to Alec Goodman for their help with the club maintenance in the early years and to John Lawton who held the keys and kept the club on Meadow Close clean and tidy for many years. Our sincere thanks go to all the above named volunteers and to the many others who have supported the club during its fifty plus year history.